KOKOMO, Ind. – Entering the 2013 volleyball season, not many would have predicted the Indiana University Cougars would finish far above the .500 mark – let along battle for a conference title. But in just its second year as an NAIA program – and first in the Kentucky Intercollegiate Athletic Conference – the Cougars shocked most observers by chocking up win after win and setting up a showdown for the KIAC regular season crown. Unfortunately for IUK, Asbury University made the drive from Wilmore, Ky., worthwhile as they topped the Cougars in four sets to claim the outright season crown (17-25, 25-10, 25-13, 25-16). In a Halloween Night match, the Cougars started strong by grabbing an early 3-0 lead on kills from Megan Riley (New Palestine, Ind./New Palestine) and Micayla Speidel (Columbus, Ind./Columbus East) and an ace off the serve of Teylor Rains (Martinsville, Ind./Martinsville). The lead reached eight points (11-3) following a spike from Rachel Allen (Lizton, Ind./Tri-West) and again (17-9) on another Speidel kill. The Eagles showed why they entered the match as the top conference team, taking eight of the next 11 points to trim the lead to 20-17. 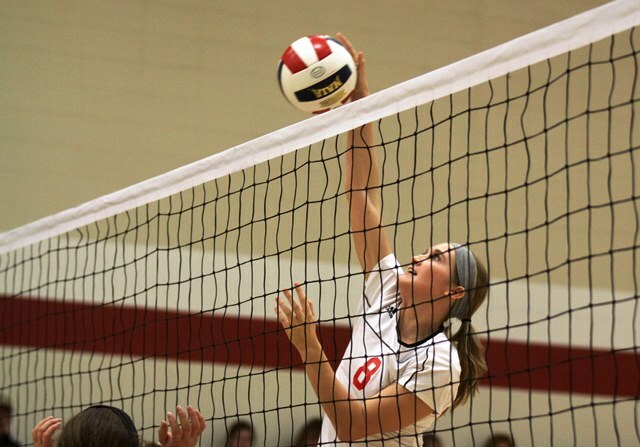 But a soaring kill by Allen gave the Cougars a little momentum and a 21-17 advantage. With Allen serving, Cortney Hansen (Logansport, Ind./Pioneer) dumped a set over the net for a point, Allen served up an ace, and back-to-back miscues by Asbury closed out an IU Kokomo first set win. Asbury came out strong in the second set, grabbing quick leads of 3-0 and 7-3. The Cougars cut the lead to 8-6 thanks to a net serve from the Eagles, but gave two points back on a pair of errors themselves. That sparked a 7-0 Asbury run and the Cougars never recovered – sending the match into intermission tied at one. IU Kokomo seemed to recover to start the third set, forcing ties at 1-1, 2-2 and 4-4. But that would be as close as they would get as Asbury cruised to the 12-point third set win. The Cougars came out strong again in the fourth set, grabbing the first point on a nice block at the net by Speidel. Asbury battled and held a 3-2 advantage when Riley and Kaley Harness (LaFontaine, Ind./Southwood) both scored on kills. Another Harness kill, followed by a point from Shelby Spall (Kokomo, Ind./Western) gave the Cougars its biggest lead of the set at 6-4. The Eagles regained the lead at 7-6 and never trailed again. While Kokomo showed grit, the Eagles were simply the better squad on this night and celebrated a conference title at the end of the set. “We could have easily quit the fourth set, but we didn’t and I am very proud of them,” said Hayes. Speidel, ranked No. 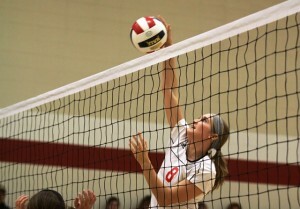 1 in the KIAC in kills, led the offensive attack with 10 kills and a block while Harnees added nine kills and nine digs. Allen had 11 digs and seven kills while Riley added seven kills and Spall five. Hanson, ranked No. 1 in the conference in assists per set, had all 38 of the Cougars assists against Asbury. Lael Burrus (Denver, Ind./North Miami) had nine digs while playing the libero position. Both Asbury (31-7, 10-1 in the KIAC) and IUK will travel to Midway College in Kentucky for the KIAC Tournament on Nov. 15-16. Asbury will enter as the No. 1 seed while the Cougars play as the No. 4 seed after tying for third place in the regular season. IU East (23-12, 9-2) will play as the No. 2 seed while IU Southeast (16-10, 8-3) is No. 3. The Cougars (27-9, 8-3) return to action on Nov. 1 with a 7 p.m. match against Marian University (17-10, 12-6 in the Crossroads League) in the final game of the season at Cougar Gym.